As if colored yesterday: so bright are the colors of this illuminated capital dating from 1487. It is the first page of the Biblia Latina, printed in four impressive volumes in Neurenberg by Anton Koberger. The accompanying commentary is by the Franciscan monk Nicholas of Lyra (†1349). Nicholas was born about 1270 in La Neuve-Lyre, near Evreux. Nicholas joined the Franciscan Order in 1291. He studied theology in Paris and Florence and afterwards he taught at the Sorbonne. 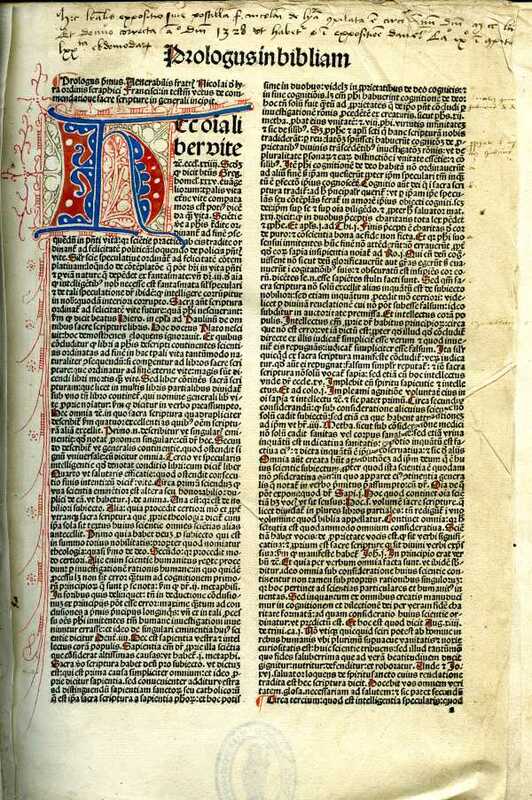 His commentary on the Bible, written between 1322 and 1331, brought him great fame. His first and main objective was the literal meaning of words and texts. Besides he stressed upon the importance of the Bible in daily life. Later scholars elaborated on his commentary and thus gave birth to this standard edition of the Bible, with commentary. Until 1600 about 200 editions were published, also in vernacular languages as Flemish, German and Italian. The first edition appeared in 1471/72. Erasmus of Rotterdam used Nicholas Lyranus’ commentary for his own edition of the New Testament, but he is often very critical of Lyranus’ work. The Biblia Latina is the oldest printed book in the library of Theodorus Groenhout (ca. 1640-1716), a priest from Noordwijk, a coastal village north of Leiden. Groenhout was born into a wealthy Catholic family from Haarlem and studied theology at the Oratoire in Paris. After his return to Holland he was active as a priest, first as chaplain in Haarlem, afterwards as pastor in Edam, Limmen and Noordwijk. Financially well-off he could afford to buy fine books, mainly dealing with Catholic theology. After his death his collection remained in Noordwijk as part of the parish library, which was subsequently enlarged by later pastors. About a hundred books date from after Groenhout’s death. The collection consists of 490 titles in 531 volumes, four manuscript works and a fine atlas in five volumes. More information can be found in the collection description. The Groenhout library is a welcome addition to the largely protestant (theological) collections at Leiden University Library.